Premium out of home media owner Ocean has expanded its exclusive vehicle recognition network (VRT) to Birmingham with the introduction of the technology to its screen covering the southern entrances to The Bullring. This brings a total number of VRT enabled locations to four full motion screens in four different cities. Audi is the launch partner for the new Birmingham screen, targeting Audi drivers with a campaign to support its after sales car service. The campaign, which was planned through Omnicom Media Group’s PHD in London and Talon, launched earlier this week and runs across all VRT locations. Developed by Ocean over the past 18 months, VRT is a clever, self-learning, self-improving system which uses a rudimentary form of AI to identify vehicle makes, models and colours, serving the drivers with personalised messages with zero wastage. 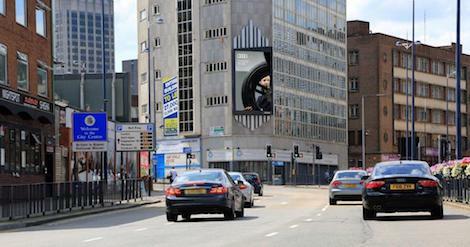 The VRT enabled Screen@Bullring South faces traffic travelling into Birmingham from the A45. Other sites include Ocean’s Holland Park Roundabout in London, The Screen on the Tyne in Newcastle and Princess Road in Manchester. This entry was posted on Tuesday, September 12th, 2017 at 06:38 @318 and is filed under DailyDOOH Update. You can follow any responses to this entry through the RSS 2.0 feed. You can leave a response, or trackback from your own site.